Today the Food Network’s blog, FN Dish #SummerSoiree is focused on tomatoes, one of the most delicious summer treats. And I’m sharing my prettiest salad, so easy that you’ll make it over and over again, my Tomato Cucumber Summer Salad! There is nothing better than homegrown tomatoes warm from your garden, but these days grocers are finding high quality heirloom tomatoes – my favorites. To make this salad, I use ripe plum tomatoes. They are evenly sized, have very few seeds, and are close to the same diameter size as cucumbers. This makes it so easy to lay out the concentric circles. I have my share of complicated recipes, but often my favorites are the simplest. These are the ones that I turn to over and over, making them so often that I never need to look at a recipe. I have made this salad for many years, often for casual get togethers with friends. The simplicity of this salad lets the luscious flavors of field ripened fruits and vegetables shine! Did you know that shallots come in different shapes, sizes, and colors? I love that I can get the salad all sliced and laid out, then cover with plastic wrap and tuck it in the refrigerator. Just before I’m ready to serve, I season the vegetables, drizzle with dressing, sprinkle with the onions, and pop it on the table while I finish up the rest of dinner. It gives the dressing time to soak into the vegetables and I always have a pitcher of extra dressing on the table in case anyone wants more (that’s usually me LOL). Of course you don’t have to present it the way I do, most restaurants serve the tomatoes in wedges with chunks of cucumbers, and diced red onions. You can do the same and just add your favorite dressing. It can’t be any easier! Make your dressings in a jar and shake instead of whisking! Be sure you slice the tomatoes a little thinner than you normally would so the slices lay flat and fairly even on the plate. I use what’s called a tomato knife that makes slicing tomatoes a dream. If you only buy one quality knife, this would be the one I recommend (along with a chef’s knife and a paring knife of course, LOL). 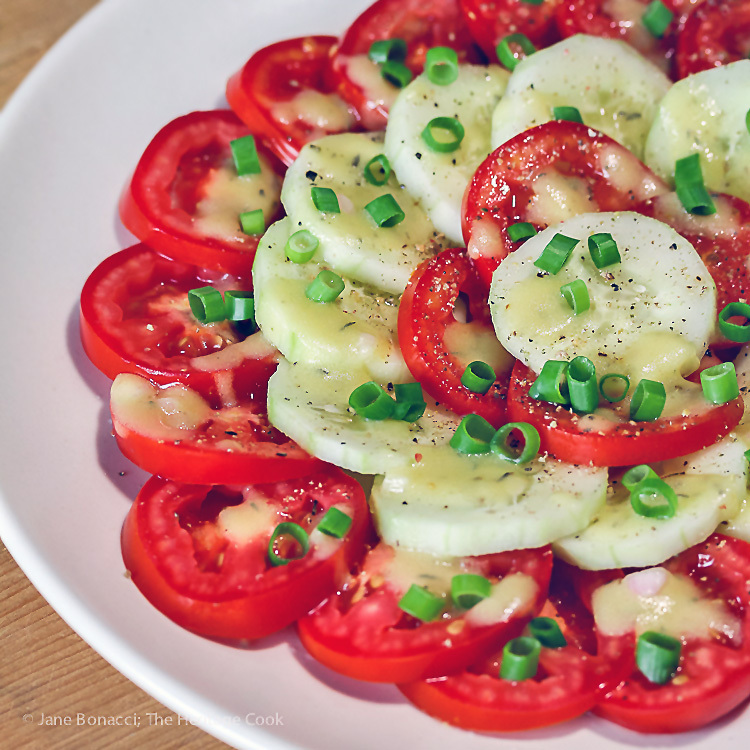 Enjoy the beautiful produce of summer with this simple, easy, and delicious tomato and cucumber salad! If you are using a store-bought salad dressing, be very careful to look for hidden gluten. Some of the sweeteners they often use can contain gluten ingredients. It’s always safest to make your own from scratch. Make the Dressing: In a clean jar with a tight lid, combine the shallots, lemon juice, vinegar, salt, and pepper. Whisk until the salt is fully dissolved then add the mustard and whisk to combine. Add the oil and thyme, put on the lid, and shake vigorously for about 30 seconds or until the dressing is emulsified. Taste and adjust seasonings. The dressing can be made up to several days in advance. Shake again before pouring over the salad. Prepare the Salad Ingredients: Rinse and cut the ends off the tomatoes. Cut into about 1/4-inch thick slices. Place them in a bowl. Peel the cucumbers and cut into slices about 1/4-inch thick. Finely chop the onions or chives. Assemble the Salad: On a large plate, starting at the outside, make a circle with the tomatoes around the plate laying each one slightly over the last one. Then just below the tomatoes, add a layer of cucumber slices. Repeat with remaining tomatoes and cucumbers in overlapping concentric circles. Grind some pepper over the top and add a little more salt if needed. Shake the dressing well and drizzle lightly over salad. Sprinkle with the onions and serve. Pass the remaining dressing at the table. Let’s connect! If you ever need any entertaining or cooking advice, need to alter a recipe for gluten-free, or want recipe suggestions, don’t hesitate to email me. Feel free to quote me, just give credit where credit is due, link to the recipe, and send people to my website. Unauthorized use, distribution, and/or duplication of proprietary material from The Heritage Cook without prior approval is prohibited. If you have any questions or would like permission, please contact me. What a pretty salad, so appetizingly fresh. This is such a gorgeous little salad! I love how fresh it looks, and it’s the perfect way to celebrate tomatoes!! Thanks so much Susan, I love this salad and have made it for many years. So perfect for warm summer dinners!